After completing Level I, the students may progress into more advanced areas of make-up. At this level, students will be exposed to areas of fashion, print, film, television, and bridal make-up applications. 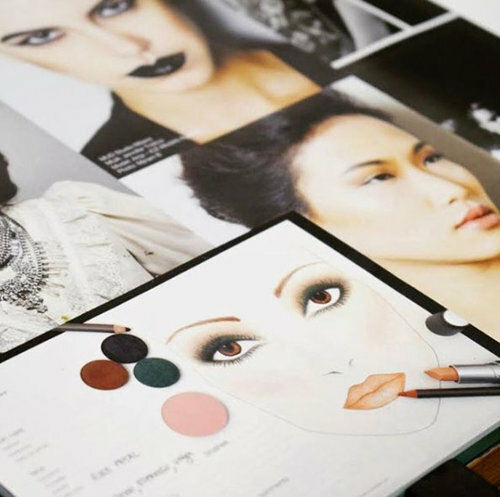 The completion of the Level II Make-up Artist Certification allows students to transfer to a USA main campus program, and may act as a substitute for 101: Fundamentals of Beauty make-up. With a focus on the lucrative world of weddings, the Bridal Make-up Artistry Course takes the student from consultation to the creation of a bride’s perfect look. The Bridal Course starts with the idea that a successful wedding make-up application starts with a clear plan. From there, students learn both business and additional make-up techniques required to be successful in the bridal business. This course consists of 6 sessions for a total of 21 clock hours. Bridal make-up is not only a great sector to work in, it also gives you a high rate of job security! One word to describe the film and television industry is demanding! Here at MUD, we prepare you for this unique experience. In Studio Make-up course we guide you through the world of high definition cameras. We teach you what is required of you to adapt make-up for different scenarios, all from film to television sets. Learn what is demanded from you behind the scenes and how to create different characters. Some people compare High Definition with the revolutionary transition from black and white to color. Its magic! Its hard! It takes special talent! Nothing of these perceptions are true! In this make-up course you will learn all the techniques needed to deal with the ever evolving HD technology. Fashion unit is one of the most creative units, and allows you, as a make-up artist, to really be creative with your make-up designs. You will create visually stunning make-ups. If you register 60 days before the beginning of the course, you will receive a 10% discount of 400 EUR. The course price is then 3,600 EUR.